The story of boxing’s Peterson brothers, Lamont and Anthony, has been well documented. Growing up in Washington, DC, they were often homeless. Then Barry Hunter came into their life. A carpenter by trade, Hunter coached amateur boxing at a local rec center. He took the brothers in when Lamont, the older by 13 months, was only 10 years old and he’s been with them ever since, a rarity in a sport where some boxers seemingly change trainers more frequently than they change their underwear. Today the brothers, who turned pro on the same card in 2004, appeared in the featured bouts of a Premier Boxing Champions show at the MGM National Harbor casino resort in Oxon Hill, Maryland, a stone’s throw across the Potomac from their old stomping grounds. And they were well-matched. Both of their fights were near “pick-‘em” affairs with the invaders the slightest of favorites. 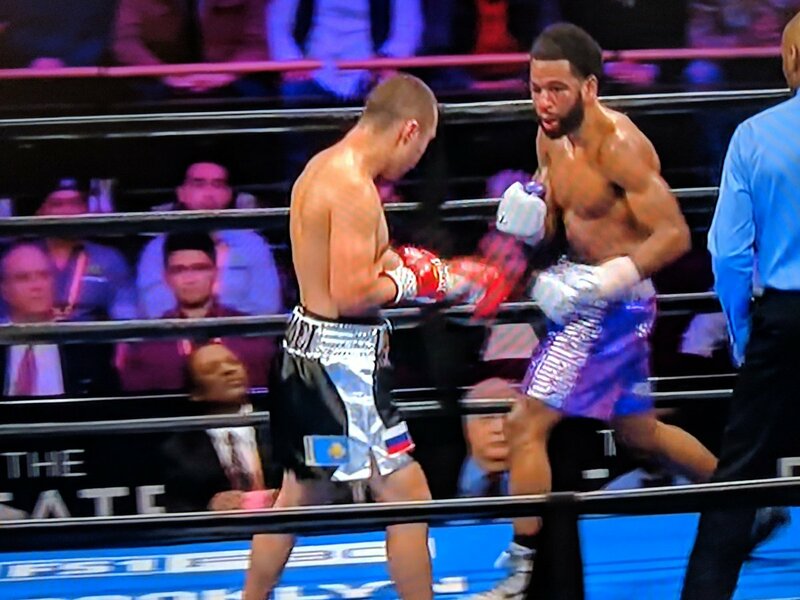 Welterweight Lamont Peterson, a former two-division champion coming off a bad loss to Errol Spence Jr, was pitted against Sergey Lipinets, briefly a 140-pound title-holder coming off a loss on points to Mikey Garcia. Peterson was seemingly ahead on the cards through several frames, but one big punch, a straight right hand by Lipinets in round eight, turned the momentum in his favor. The end came two rounds later when Lipinets hurt Peterson with on overhand right and followed up with an assault that sent the DC man down hard. Peterson arose on spaghetti legs but it was a moot point as his corner tossed in the white flag almost as soon as he hit the canvas. The official time was 2:59 of round 10. After the fight, in an emotional moment in the ring, Peterson announced his retirement. If he holds tight to this decision, he will leave the sport with a 35-5-1 record. Sergey Lipinets, a kickboxing champion before he took up conventional boxing, improved to 15-1 with his 11th win by stoppage. Overall it was a good action fight with a high volume of punches thrown. The co-feature, a 10-round junior welterweight contest between Anthony Peterson (37-1-1, 1 ND) and former IBF 130-pound champion Argenis Mendez (25-5-2) ended in a draw. The decision was unpopular with the pro-Peterson crowd but met the approval of the TV commentators and likely most everyone tuning in at home. Both fought a technical fight. Peterson did most of the leading and seemingly had the fight in hand going into the late rounds where Mendez did his best work. There were no knockdowns or cuts, but Peterson suffered severe swelling over his left eye. The last round was the best with Mendez fighting with more urgency, perhaps out of fear that he would be victimized by a hometown decision. Anthony Peterson was making his first start since January of last year when he coasted to an easy decision over Eduardo Florez, a decision later changed to a no-contest when Peterson tested positive for a banned substance. In the swing bout, an entertaining 10-round contest in the 154-pound weight class, Cincinnati’s Jamontay Clark (14-1) overcame a rough patch in the third round to score a unanimous decision over Chicago’s Vernon Brown (10-1-1). The scores were 95-94 and 96-93 twice. At six-foot-two, the rangy Clark had a 7-inch height advantage.